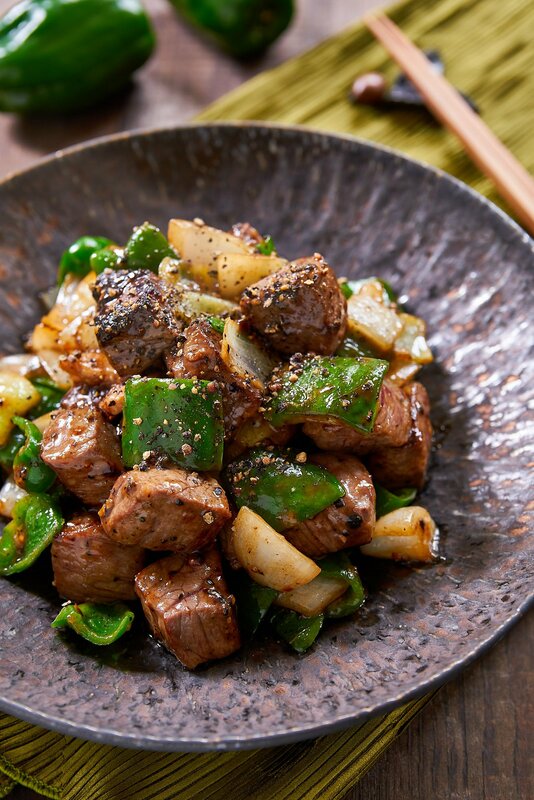 Hei Jiao Niu Liu (黑椒牛柳), or Black Pepper Beef is a fast, easy stir-fry made with beef, onions, and peppers seasoned with oyster sauce and loads of black pepper. My take on this Chinese classic features big juicy chunks of steak which gives the dish more substance and a bold, beefy taste. But did you know that there was a time where the value of black pepper rivaled that of gold? After making its way to Europe, black pepper was such a sought-after commodity that when explorers brought chili peppers back from the America’s, poor monks started growing them as a cheap knock-off of black pepper. These days, chili peppers get more love than the original pepper, but there’s something about that creeping, mouth-warming heat that still makes black pepper one of my favorite spices. Even a dish as simple as spaghetti tossed with butter and cheese is elevated to new heights by simply adding black pepper. Some things were made to be together: Big Bird and Mr. Snuffleupagus, peanut butter and jelly, and the color red on a Ferrari are a few classics that come to mind. Whether you live in Boston, Bordeaux or Beijing, you’ve probably sprinkled some pepper on your beef at one time or another and it’s a combo that works famously well. I love this Chinese take on peppered steak because it features the bold flavor of black pepper front and center. 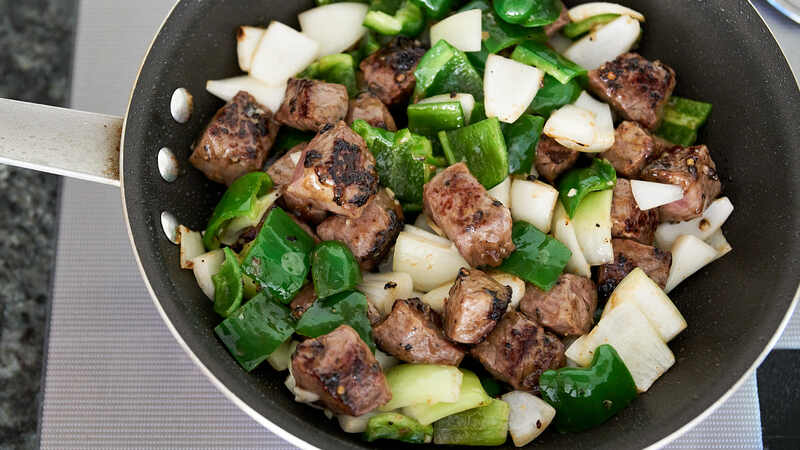 With big savory chunks of beef, sweet onions and crisp green peppers coated in a glaze of oyster sauce, it has a satisfying balance of tastes, textures, and colors that are sharply accented by the smoldering heat of the crushed peppercorns. 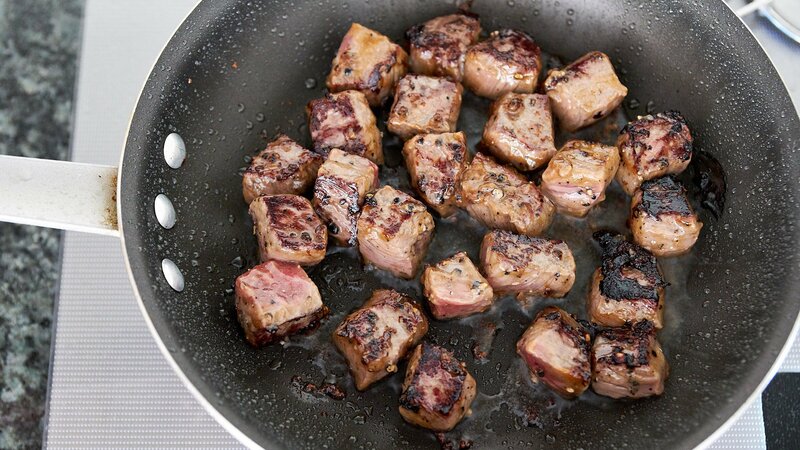 Although Black Pepper Beef is usually prepared with thin strips of beef, I like using cubes of good steak meat such as filet mignon, new york strip, or ribeye. This mashup between a western steak and a Chinese stir-fry cuts back on the amount of meat, but with bite-sized pieces of beef that are caramelized and savory on the outside, and tender and juicy on the inside, it’s precisely the kind of dish I crave when I have the occasional itch for steak. Best of all, there’s no need to fuss over cooking a thick slab of meat to perfection, and the vegetables are included, imbuing them with flavor while leaving you with only one pan to wash at the end. Put the black peppercorns in a mortar and use a pestle to crack the peppercorns coarsely. 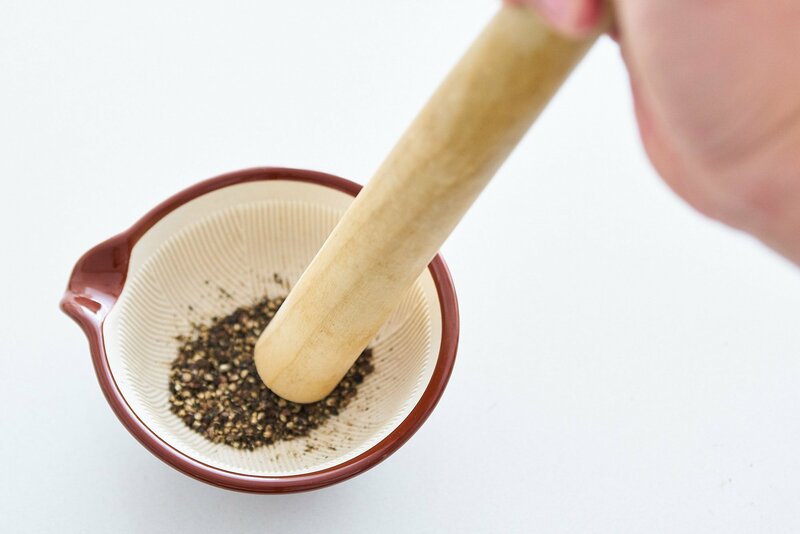 If you don’t have a mortar and pestle, put the peppercorns in a freezer bag and use a rolling pin to crush them. 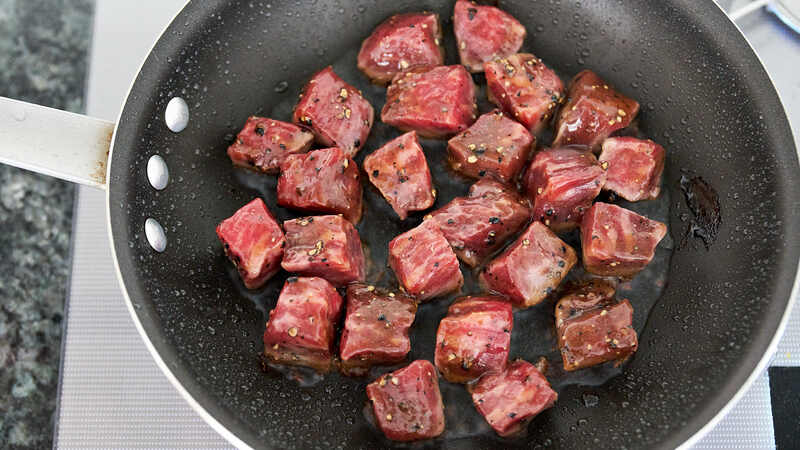 In a bowl, combine the cubed beef along with most of the black pepper (saving a little to garnish), oyster sauce, Shaoxing, soy sauce, potato starch, and sesame oil. 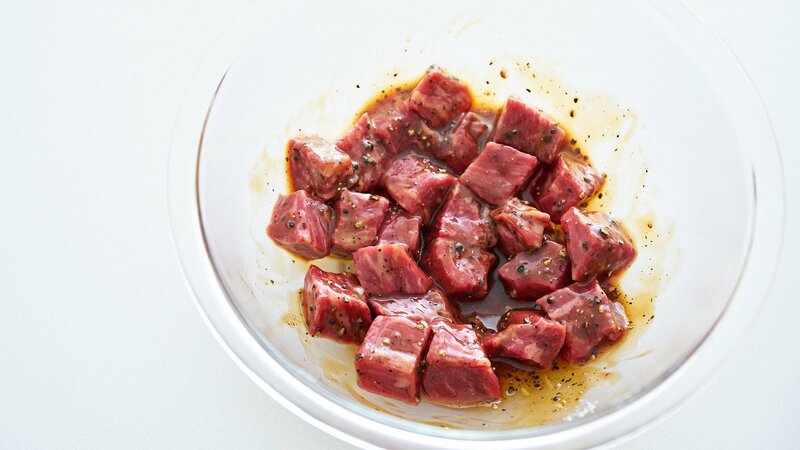 Mix well to combine and allow the beef to marinate for at least 15 minutes, or up to 12 hours in the fridge. Heat a frying pan over medium-high heat until hot. Add the vegetable oil, and then use tongs to add the beef in a single layer. Try to leave as much of the marinade in the bowl as possible. Fry the beef on one side until golden brown, and then flip each piece and fry the second side, until browned. Dump the onions, bell pepper, and garlic into the pan and turn the heat to up to high. Stir-fry, tossing the contents of the pan periodically to ensure everything cooks evenly. 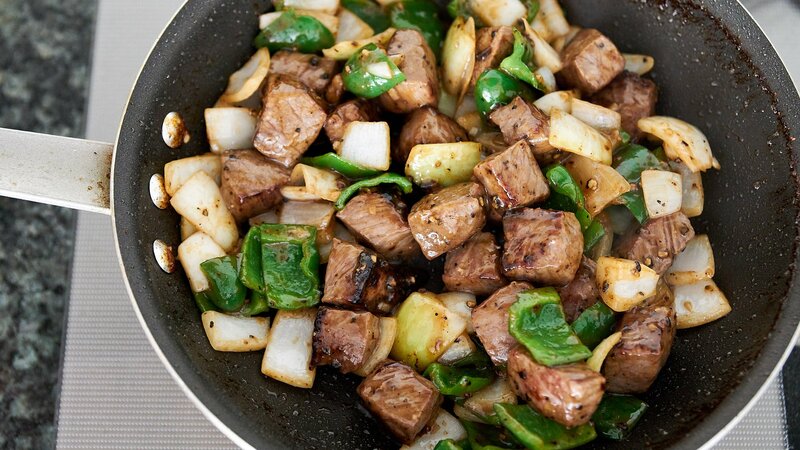 When the onions start becoming translucent, add the remaining marinade and toss everything together until the black pepper beef is shiny and evenly coated with sauce. Serve with rice and garnish with the remaining black pepper (to taste). This recipe is simply amazing Marc, thank you!! Brilliant!!! I love the linger of the black pepper. I used a good rib steak and can’t get over how simple and delicious this is! Thank you Marc. I’m glad I found you online. Hi Nadine, you can steam some Cruciferous Veggies (broccoli, rapini, etc) and then toss them with some oyster sauce. Or you could sauce some garlic and then add in some spinach. I see you posted this a month ago. So, I’m not sure if you will even see this reply but how about a salad of shredded cabbage, carrots, and cucumbers with an Asian Dressing. My go to dressing is: 2 Tablespoons each of soy sauce, red wine vinegar, sesame oil, and sugar plus 1 teaspoon of yellow hot dog mustard. Add in some ginger if you want (about 1 teaspoon or to taste). You’re welcome, I hope you enjoy it!